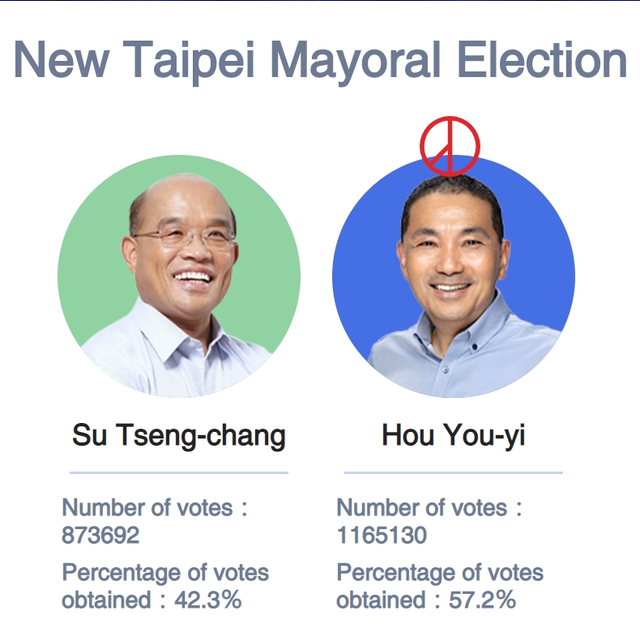 Taipei, Nov. 24 (CNA) Former New Taipei Deputy Mayor Hou You-yi (侯友宜) of the Kuomintang (KMT) has become the city's new mayor after beating his Democratic Progressive Party (DPP) rival, former Premier Su Tseng-chang (蘇貞昌), in Saturday's election. In his victory speech, Hou said it was his first time competing in an election and was an important win for him. Hou, 61, expressed gratitude to his family and supporters and pledged to do his best as mayor of New Taipei, the most populous municipality in the country. A former head of the National Police Agency (NPA), Hou served as New Taipei deputy mayor under Eric Chu (朱立倫) from December 2010 to March 2018, when he resigned to run for mayor. Hou is a highly decorated police officer who became famous as a result of his work on many high-profile cases, including the 1997 kidnapping and murder of Pai Hsiao-yen (白曉燕), the only daughter of entertainer Pai Bing-bing (白冰冰). In 2006, Hou became the youngest person in Taiwan's history to head the NPA, and two years later he was appointed president of Central Police University.